San Francisco — Congresswoman Nancy Pelosi, House Democratic Leader, Mayor London Breed and District 9 Supervisor Hillary Ronen will speak at a community celebration for a U.S. Department of Education $6 million, two-year federal grant to San Francisco’s Mission Promise Neighborhood (MPN). The event will take place on Wednesday, September 19, at 4 p.m. at Buena Vista Horace Mann K-8 Community School, with a concurrent resource fair for families, plus games for children led by employee volunteers from Google trained by staff from MPN partner Jamestown Community Center. During its initial five years, the MPN education initiative’s 20+ invaluable community partners have showcased significant results. For example, John O’Connell High School graduation rates for Latino students increased from 62 percent to 88 percent, while graduation rates for African American students increased from 46 percent to 93 percent. These impressive graduation rates are now outpacing those of San Francisco Unified School District (SFUSD) overall. With a model of family economic success translating to student academic success, Mission families have been strengthened by being connected at school to a combination of free services running the gamut from financial coaching and career training to quality health care and access to high-quality early education centers. Stabilizing housing in a neighborhood experiencing gentrification has also been a concern addressed by the community partners. “We are grateful to our D.C. leaders who pushed forward the legislation to provide much-needed extension funding for Promise Neighborhoods. MPN’s collective impact would not be possible without the combined support of federal, state and local officials, SFUSD, principals, teachers and over 20+ Mission District partners developing best practices in creating equity so that all of our students have the opportunity to get to college,” explained District 9 Supervisor Hillary Ronen. 1. ¿Cuando es el evento? Sabado, 28 de Julio, de 9:30 a,m, to 2:30 p.m. Registración comienza a las 9 a.m.
2. ¿En donde se llevará a cabo el evento? City College of San Francisco-Mission Campus, 1125 Valencia St., San Francisco. 3. ¿Que es el Foro Educativo? El objetivo del Foro Educativo es reunir organización de la comunidad y a padres para intercambiar conocimientos y opiniones sobre temas importantes para la comunidad. Durante el día, los padres eligen dos talleres para asistir de temas que les interesan mas. Los padres también tendran la oportunidad de platicar con organización que ofrecen recursos y aprender como pueden obtener eso recursos. 4. ¿Necesito registrarme antes del evento para poder asistir? No es requerido registrarse antes del día del evento. 5. Quién puede atender este evento? Familias que viven o asistan escuelas en el Distrito de la Mission. 6. ¿Cuántas mochilas podré recibir? El dia del evento recibirá el máximo de 4 brazaletes, que es el mismo número máximo de mochilas que podrá recibir. 7. ¿Tienen que estar presentes mis niños para recibir las mochilas? No es necesario que estén presentes para recibir sus mochilas. 8. ¿Habra cuidado de niño? Proveeremos actividad para niños de 5 a 12 años. Ofreceremos pequeños bocadillos en la mañana de desayuno. En la tarde daremos un almuerzo que se pueda llevar. 10. Dónde puedo recibir más información sobre el evento. Puede llamar al (415) 282-3334 ext. 149; missionpromise.org. 1. When is the event? Saturday, July 28, 9:30 a.m. to 2:30 p.m.. Registration starts at 9 a.m.
2. Where will the event take place? 3. What is an Education Forum? The purpose of the Education Forum is to bring community partners and parents together to exchange knowledge and opinion about topics important to the community. During the day, parents choose two workshops to attend around topics that interest them. Parents also get to connect with community partners offering resources. 4. Do I have to pre-register for the event? No, you do not need to pre-register to attend this event. 5. Who can attend this event? Families that live or attend schools in the Mission District. 6. How many backpacks can I receive? Four bracelets is the maximum per family — equivalent to the number of backpacks you can get. 7. Do my kids need to be present to receive a backpack? No, kids do not need to be physically present. 8. Will there be child care? Children’s activities will be provided for ages 5 to 12. 9. Will there be food? There will be a light morning snack and a to-go lunch in the afternoon. You can call (415) 282-3334 ext. 149; missionpromise.org. The “Week of the Young Child” — an annual celebration sponsored by the National Association for the Education of Young Children — commemorates early learning, young children, their teachers, partners, families and community members. This year’s dates are April 10-16. Mission Promise Neighborhood Early Learning Family Success Coach Ada Alvarado celebrates young children every week, acting as a connector to free services for kids ages 0-5 and their families. One of the goals of the Mission Promise Neighborhood is to inform families with young children of the connection between quality early care and education (child care and preschool) and school readiness. Mission Promise Neighborhood encourages more families to enroll their children in high-quality early care and education programs, and to be informed about the resources that are available to promote school readiness with their little ones. As a country, we have become more aware of the importance of healthy development,high-quality early education and school readiness and this is a message that gets shared daily with the community in the Mission. Based on data collected in 2014 for the Mission Promise Neighborhood Survey, 29.5 percent of the families with a child 0-5 reported that their child attended a formal center-based or home-based program. We know that there are higher numbers of children ages 3 to 5 that are attending a pre-K program; the bigger challenge is the infant-toddler population. The Mission Promise Neighborhood community is working to address this challenge. An example of this is the Mission Neighborhood Centers Early Head Start and Head Start program. “They are responding to the need by increasing their infant-toddler slots,” says Liz Cortez, Mission Promise Neighborhood Early Learning Manager. There are many resources for families in San Francisco. For example, San Francisco is a leader in universal preschool, or Preschool For All (PFA), which aims to expand preschool access and improve preschool program quality for all 4-year-old children residing within San Francisco County. Depending on whether the school is private or public, the costs are partially or completely covered by First 5 San Francisco. In addition to formal programming, there are many resources available for families with young children. Funded through First 5 SF, the Department of Children, Youth and their Families, and the Human Services Agency, every neighborhood has a Family Resource Center (FRC), where families can access child development and family development resources. In the Mission, there are four FRCs: Felton-FSA; Good Samaritan; Homeless Prenatal; and Instituto Familiar de la Raza. Three of the four organizations are Mission Promise Neighborhood partners. Mission Promise Neighborhood Early Learning Family Success Coach Ada Alvarez is placed at two of these FRCs, where she provides a variety of services, but mostly focuses on connecting families to four main services of immigration, housing, workforce, and early care and education resources. 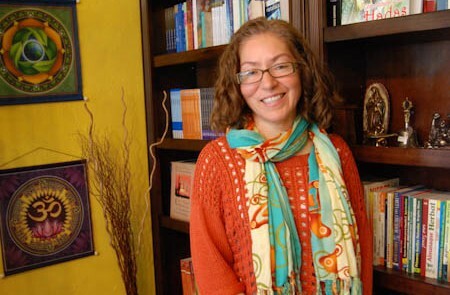 Alvarado, a former preschool teacher, brings vast experience to her work and is very passionate about informing families in the Mission about the many resources and opportunities for young children and families. She does this by connecting with families in various ways: by helping families to place their children on the San Francisco Child Care Connection (SF3C), an online system that uses a single application for families seeking subsidized care, by providing workshops, and by attending events that promote early literacy. A good example of this is a recent workshop she helped to coordinate with Good Samaritan staff on the importance of a preschool experience and how families can access the variety of programs that are available (photo). They partnered with two other Mission Promise Neighborhood partners — the SFUSD Early Education Department and Mission Neighborhood Centers Early Head Start/Head Start — to present to a group of parents on March 23. Then there are social skills, with conflict resolution and being able to follow a routine expected upon enrollment in kindergarten. Continues Alvarado, “Parents do not always have the tools necessary to get their child on the right track, especially if they are immigrants with circumstances that translated to them not being able to achieve a high education level in their homeland, or if they do not speak English well.” Good Samaritan provides ESL classes to many families, so they focused on this group of immigrant families to impart the importance of preschool. Alvarado has come to realize that the families with whom she works experience many barriers in accessing high-quality early care and education programs in the Mission. Some of the barriers are the lack of infant-toddler capacity compared to the number/need of children under 4 years of age, families’ comfort level with accessing services, and the cost of high-quality care for children that do not qualify for a subsidy. Early Head Start/Head Start, for example, requires a family to meet the Federal Poverty Level Income Guidelines. For 2016, a family of three would need to make under $20,160 to qualify. As “Week of the Young Child” is celebrated in the Mission Promise Neighborhood, let’s honor all of the teachers, partners, families and community members that better children’s lives every day, meeting challenges and creating impact. 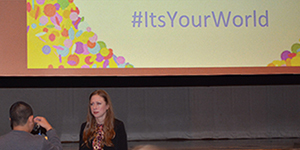 Just five weeks shy of her thirteenth birthday when she headed to D.C. to live in the White House, Chelsea Clinton knows plenty about public life. That early experience was the impetus for her recently released first book, “It’s Your World: Get Informed, Get Inspired & Get Going,” a primer for adolescents looking to become more engaged in their community’s issues … and those of the world. Now a socially conscious 35-year-old, Clinton is on a rigorous, 20-city book tour, with her stopping by the Mission Promise Neighborhood’s Everett Middle School on Tuesday. Hundreds of students packed the ornate school auditorium, as they eagerly awaited Clinton’s appearance. Clinton’s book is already educating young readers on topics running the gamut from poverty and access to education to climate change and the struggle for gender equality. All proceeds from book sales are donated to the Clinton Foundation and other charities. A roar of applause greeted Clinton as she took to the floor after being introduced by a trio of Everett students. She spoke of her background, being in a political world at a young age. Clinton also spoke about her early travels, mostly with her mother, to places such as Sub-Saharan Africa, where, as an adolescent, she saw abject poverty and knew the issue needed to be addressed. After Clinton’s talk, with students’ rapt attention, it was time for the latter to ask questions. One by one they came up to the microphone, asking such things as “How can we help endangered species?” and “How can we stop sexism?” The second question prompted Clinton’s longest answer. She explained to the shocked adolescents that there are 10 countries in the world where a woman cannot go outside without being escorted by a man. That in Massachusetts there is still a law on the books stating that a 12-year-old girl can be married, if her parents want that to occur. All in all, there were about a dozen questions for Clinton. To conclude the event, Everett’s principal, Lena Van Haren, gave Clinton an idea for a second book: to tell the story of a school looking to change the world. That school? Everett, of course. Many people mistakenly believe that Cinco de Mayo is a celebration of Mexico’s independence– an event that is actually commemorated every September 16th. Here’s a quick history lesson to set the record straight. After the Mexican-American and the Reform wars of the mid-19th century, Mexico was mostly bankrupt, so the nation put forth a two-year moratorium on payments of all of its foreign debts. A trio of European powers–Spain, England and France–sent naval forces to Veracruz to demand payments. While Spain and England ultimately negotiated with Mexico, France seized the opportunity to attempt to carve another piece of their empire out of Mexican territory. The result was a May 5th, 1862 battle in the east-central state of Puebla, with heavily armed French forces outnumbering their poorly supplied Mexican opponents. Despite these odds, Mexico decisively won under the leadership of General Ignacio Zaragoza Seguin, a Texas-born Mexican. This created a sense of national pride still commemorated today, especially because the seemingly omnipotent French army had not suffered a defeat in the five decades prior. Some historians surmise that if the French had won the Battle of Puebla, their stronghold in the region could have led to the European nation interfering in the American Civil War by aiding Confederate forces. This could have meant a very different outcome in that conflict, thereby changing the course of U.S. history. Over a century and a half later, Cinco de Mayo has become an annual celebration filled with music, dance, song and plenty of regional food. The festival is held throughout the United States and Mexico, the latter primarily in Puebla. On Saturday, San Francisco’s Cinco de Mayo, a true feast for the senses, was held in the Mission on Valencia between 21st and 24th streets. Mission Neighborhood Centers, a valued community partner, hosted its 11th annual Cinco de Mayo celebration, with a good time being had by all. 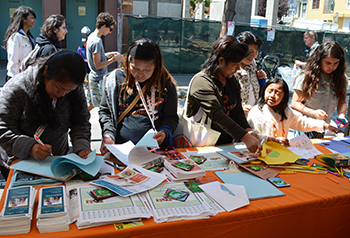 The Mission Promise Neighborhood had a resource table, availing community members of free services for family economic success. Cinco de Mayo still helps define a community’s strength. Thinking about heading off to college can be daunting, for students and parents alike. Especially when it comes to paying for that degree. Most students needs some sort of financing package and that’s where Free Applications for Federal Student Aid (FAFSA) comes in. Think of FAFSA as the gateway to money for higher education. Not only is FAFSA used to apply for federal student aid–the Federal Pell Grant, Federal Work-Study, Federal Perkins Loans and Federal Stafford Loans–it is also used to apply for student financial aid from state governments and most colleges/universities. According to the U.S. Department of Education, the federal government annually awards about $150 billion in the form of grants, work-study funds and low-interest loans to help millions of students pay for college. It is a big mistake for a student to fail to apply for FAFSA. While January 1st is the initial day you can submit your form, it is better to have income tax returns filed before tackling a FAFSA application. Don’t wait too long: students who apply in the first quarter of the year obtain more money than those applying later. In California, a March 2nd online submission date, or postmark on a mailed application, is the deadline for many state financial aid programs. According to the U.S. Department of Education website, there are four misconceptions around qualifying for financial aid for college. I (or my parents) make too much money, so I won’t qualify for aid. I’m too old to get financial aid. The form is too hard to fill out. While the last point may seem true, with 103 questions to be answered on this year’s form, you don’t need to go it alone. To help Mission Promise Neighborhood students and parents wade through this 10-page application, come to MEDA’s FAFSA Preparation Assistance Night on Wednesday, February 25th, from 6pm to 8pm at Plaza Adelante. Bank of the West is sponsoring this free event and will be sending volunteers to sit with applicants and help them submit their FAFSA forms (pre-register). All participants will be entered in a raffle to win a Nexus 7 tablet–perfect for taking to college. Think of FAFSA as the first step to a successful college experience. As we take time today to ponder the legacy of the late Martin Luther King Jr., it is important to note that the civil rights leader was fighting for justice for all Americans. That includes Latinos. There is even more to commemorate this year, which marks the 50th anniversary of the civil rights marches in Alabama–from Selma to Montgomery–that helped spur the passage of the historic 1965 Voting Rights Act. King based his idea of nonviolent protest on Mahatma Gandhi’s strategy for India’s independence from British Empire decades before. The important farmworkers’ protests, led by Cesar Chavez and Dolores Huerta, followed King’s model. MLK was more than an inspiring symbol: he provided emotional and public relations succor to the Latino Civil Rights Movement. King’s inspiration can still be drawn upon today, as the fight for economic and social justice continues. To showcase King’s impact on the Latino community, one need look no further than San Antonio, Texas. That’s correct: the seventh-largest city in the nation, boasting a Latino population of a whopping 63 percent, with just seven percent African-Americans, holds what is deemed the largest MLK celebration in the country. “Dr. King’s legacy is very much alive within the Latino community. His dream is a universal one. As a community, Latinos strive toward social equality and justice. Dr. King’s message embodies the spirit, strength and progress we continue to push for, and serves as an inspiration on a daily basis,” states DreamVoice Public Relations Specialist Cassandra Yardeni. Yesterday, there was a wreath-laying ceremony at the city’s statue to King. Today, there will be a two-and-three-quarter mile march down San Antonio’s Martin Luther King Jr. Boulevard, with over 100,000 attending. Interestingly, the city’s serpentine Cesar E. Chavez Boulevard starts nearby, just a block westward. There are myriad Bay Area events commemorating the life of Dr. King. If you are on the Peninsula, there is an 8:30am MLK event at the San Mateo Caltrain station, with a “Freedom Ride” to San Francisco at 10am. If in San Francisco, take part in the annual MLK Day festival, march and parade around Yerba Buena Gardens. Attend a full day of free events, festivals and programs, plus a march and parade, commencing at 11am, from the Caltrain station to Yerba Buena Gardens to commemorate the Selma to Montgomery march. While there is still much to be done as far as Latino civil rights, the gains made in the past five decades are owed in part to Martin Luther King, Jr. Words to remember today, and every day. It was an early Thanksgiving feast, Latino-style, held at MEDA’s Plaza Adelante on November 14th, with staff and promotoras sharing a meal. It was time to give a year-end thanks to these amazing community outreach workers, the six women who began working with MEDA and the Mission Promise Neighborhood (MPN) last spring. Their first community outreach was successfully conducting an intensive MPN neighborhood survey, and they have done outreach for many other events since. On the cosmopolitan, potluck menu for everyone’s enjoyment were: chuchitos (tamales) from Guatemala; baleadas (flour quesadillas with beans and meat) from Honduras; mole con pollo from Mexico; galletitas Peruanas; refried beans and Mexican rice; salsa with homemade tortillas; and picadillo de carne from Panama. A true feast. Friday night was not about work though–it was about sharing, relaxing and enjoying. The conversation centered on the topics of food, traditions, culture and family. It was a night of breaking bread together, compartiendo historias (sharing stories) and laughing about names of foods and idioms from each country that mean something completely different in another nation. Laughter filled the voluminous conference room that served as the venue for the feast, with background sounds of children joyously playing. Suddenly, two little boys began distributing to each dinner guest a cup filled with a green shake. It turns out Michelle Reiss-Top (a.k.a. MEDA’s “Salesforce Queen”) had brought fruits, vegetables and a blender, with she and her sons, Everett and Henry, busily preparing concoctions. “What is that?” asked a promotora’s six-year-old daughter. “Try it,” cajoled eight-year-old Henry. Small sips first occurred, with all drinking cautiously, having never downed a kale drink before. Suddenly, like magic, everyone wanted more. Later, another drink concoction was presented, this one similar to MEDA’s robust burgundy–the color of life. This drink actually sufficed as dessert, with the sweetness of berries and apples making the vegetables fade to the background. Everyone wanted the Reiss-Top family recipe by the end of the night. All toasted to health. Not everyone knows the long-standing role of promotoras in the Mission. Think of them as domestic workers. They clean houses. They baby-sit. They wash dishes. When the promotoras return home after a hard day’s work, they still have to make dinner for their own families, meaning more housecleaning and dishwashing. When they come to their MPN workshop each Tuesday, these indefatigable women never leave Plaza Adelante until they have left everything in better condition than when they arrived. That is their work ethic. When a short time thereafter everyone adjourned to the kitchen to begin cleaning up, it was discovered that room was spotless, with every dish washed and put away, plus every composting product and recycling item already in the correct receptacle. The promotoras’ mouths were agape: they could not believe that this night they would not have to wash dishes after dinner. They were allowed to simply enjoy the evening. This was a true Thanksgiving of gratitude, all around. 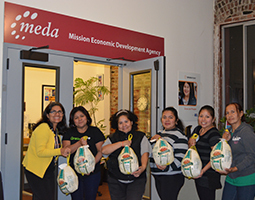 From MEDA and Mission Promise Neighborhood staff, we wish all of our clients and stakeholders the best Thanksgiving imaginable. Thanks to you for making MEDA’s work possible. Addendum: On November 25th, all promotoras were given a donated turkey, so they can share a meal with their family tomorrow. The picture says it all! You wouldn’t think seafood paella and backpacks have much in common, right? Well, it’s time to think again! On Tuesday, July 29th, renowned San Francisco eatery Cha Cha Cha is hosting a “Mission Backpack Giveaway Fundraiser & Happy Hour.” The Mission District restaurant has generously offered to donate a portion of the night’s revenue to an important neighborhood cause, as folks indulge in some classic New World cuisine. What is the cause? To raise needed funds for the Saturday, August 9th, 3-in-1 “Back to School Event” the Mission Promise Neighborhood (MPN) is holding. In December 2012, MEDA received a $30-million federal grant to replicate the successful Harlem Children’s Zone in the Mission District of San Francisco. The goal of MPN is to guide kids on a cradle-to-college-to-career continuum, partnering with 26 organizations that also provide client services. Part of this initiative is making sure schoolchildren have the tools they need to do well in their studies, hence the need for this fundraising event. The backpacks are ready–the goal is to be able to fill these 2K backpacks with needed back-to-school items. Many Mission District students come from financially challenged families, meaning the cost of a backpack and school supplies cannot compete with a family trying to pay rent and put food on the table. Such families look forward to this event, as they prepare their children to head back to class 100% primed to achieve. This August 9th happening will actually include a trio of events: a Backpack Giveaway, supported by the San Francisco Mayor’s Office and Target; MEDA’s third “Get Connected!” event, presented by Google and LinkedIn, with tech volunteers teaching Mission residents differing levels of digital literacy; and a Mission Promise Neighborhood Resource Fair, supported by MPN partners who will avail the community of their variegated free services. MPN showcases the power of community, epitomized by this fundraising event at Cha Cha Cha on July 29th. In a neighborhood where the high-end restaurant is becoming more common than the once-ubiquitous taqueria, MEDA backs the creation of the Calle 24 Latino Cultural District. District 9 Supervisor David Campos, born in Guatemala and now representing the Mission District, was at the vanguard of pushing this resolution, which was passed unanimously by the San Francisco Board of Supervisors yesterday. The idea is to preserve the rapidly changing Mission District, much the way the city’s Japantown was created near Geary Boulevard in the 1960’s. 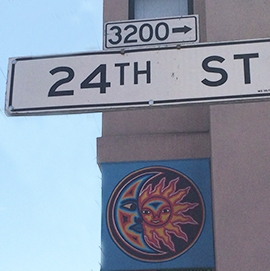 Spanning fourteen city blocks, Calle 24 comprises the stretch of 24th Street bounded by Mission to the west, Potrero to the east, 22nd to the north and 25th to the south. A walk down this street today reveals a bustling scene, with mostly Latino shoppers filling the aisles of small businesses that cater to this community. Many of these consumers are the 5,000+ clients of MEDA, with 24th Street the main commercial hub for families of the quartet of Mission Promise Neighborhood schools. “This is a chance to preserve the flavor of the Mission. Now, when an item comes before the Planning Commission, there will be an extra conditional-use process to specifically benefit businesses, cultural institutions and events that market to the Latino community,” explains MEDA’s Policy Manager Gabriel Medina. One microbusiness in the corridor that will benefit will be Mystical Collections, at the northeast corner of 24th and South Van Ness and owned by Mexican immigrant Patricia Torres. One of the first entrepreneurs to start her business at El Mercadito, the microbusiness incubator at MEDA’s Plaza Adelante, Patricia’s business idea was to sell holistic products–an idea that came about after her son’s adverse reaction to medication. Able to move her business to nearby 24th Street after only 18 months, Patricia then doubled her store size by using the business acumen garnered from MEDA’s free Business Development program. Patricia has since created a strong customer base and has hired employees. The creation of Calle 24 will ensure Patricia’s business remains strong and where she wants it to be, serving the Latino community she loves. A celebratory press conference to announce the district is planned for Friday, May 23rd, starting at 2pm. Mayor Lee and Supervisor Campos will be at the corner of Harrison and 24th streets to cut the liston rojo (red ribbon).